Laura Cooper manages three sons, a husband (currently running for City Council, see johncooperforcouncil), and three dogs. She also manages to read widely, think deeply, and consider the big picture: why are things as they are? When popular culture tells stories about itself, it can leave some rich parts out. Consider this narrative: mainstream American women didn’t claim the freedom to dress for style AND comfort until the 1960s. Right? Girdles and bullet bras one decade; bell bottoms and “That Girl” the next? That was my vague notion too, fed by Doris Day movies and Mad Men. Until I stumbled upon this jewel of a book: Claire McCardell: Redefining Modernism, by Kohle Yohannan and Nancy Nolf (Abrams, 1998). Never heard of Claire McCardell? Never mind. But let me ask you. Do you ever wear no-iron, synthetic-mix separates, say, a skirt or skinny pants with a fitted knit pullover? Ever wear yoga pants out to lunch? Do you own ballet flats? If you answered “yes” to any of these questions, it’s fair to say Claire McCardell’s been dressing you, whether you’ve known it or not. While you’re thinking, here’s some background. In 1905, Claire McCardell was born in Frederick, Maryland, her father the pillar of a prominent banking and political family. Her mother, a transplant from Jackson, Mississippi, had her fashionable clothes copied out of American and European magazines by a dressmaker who’d come work at their home a few weeks every year. Claire would stick close, watching the seamstress choose (and reject) different fabrics, then drape, cut, and sew them into clothes for the whole family – banker father and three brothers included. In 1925, Claire made her way to what is now Parsons School of Design in New York, determined, she wrote a friend, “to save the world from ugliness and dreary clothes.” She was chasing a job that didn’t yet exist. It’s hard to imagine now, but at that time there was basically no such thing as an American fashion designer, like we’d recognize. A few high-end, one-of-a-kind dressmaking salons might use an original designer, in-house, but otherwise clothes manufacturers would hire “sketchers” to copy French couture fashions, modified to sell in the lower-priced mass market. It took a Parsons year in Paris for Claire to find her business model: the houses of Coco Chanel and Madeleine Vionnet, who designed with freedom and control, from the sketchpad through the final drape of fabric on a showroom model. With their own names on every label. Vionnet especially fascinated Claire. The Chanel legend overshadows Vionnet now, but in the ‘20s and ‘30s she was recognized as a hugely influential design revolutionary. A leader in the movement to reject stiff, padded, and corseted clothes that distorted women’s bodies, and inspired by dance innovator Isadora Duncan, Vionnet was among the first to use soft, draping fabrics like chiffon, charmeuse, and satin to reveal a woman’s natural shape. And here’s a juicy fact for the fabric nerds among us. Vionnet gets credit for first constructing dresses on the bias, cutting the fabric on a 45° diagonal to the ordinary, straight vertical-horizontal fiber weave. Bias cutting makes the fabric swirl and cling to the body. Think Marlene Dietrich and Greta Garbo. Madeleine Vionnet built clothes, more than just sewed them. Claire returned to New York inspired by her techniques, by her architectural discipline with innovative fabrics and, even more, by her insistence that fit take its cue from the body. 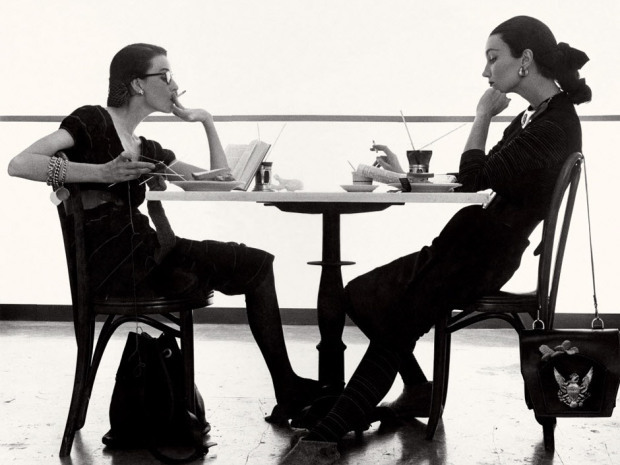 But New York wasn’t ready for Claire McCardell. She rattled around lackluster jobs (painting flowers onto paper lamp shades, cutting patterns in a wholesale house), and worked as a department store fit model. After a few false starts as an underling designer (she was loudly fired before a showroom full of clients and employees for “always making clothes that would please herself”), she was hired as a design assistant at Townley Frocks, a mid-market dress and sportswear manufacturer, where she became chief designer in 1932, at age 27. This still wasn’t the job McCardell had in mind. Townley Frocks, a conservative commercial house, demanded priced-down copies of French designs, like they’d always sold. McCardell, by contrast, wanted American women to wear distinctly American clothes: clothes that were beautiful and feminine but also casual, allowing for comfort and movement. She imported the free-flowing dirndl skirt from Austria, and (echoing Chanel) she borrowed details from American golf, tennis, and ski clothes, like high wool-knit turtlenecks, utilitarian pockets, and stout metal fastenings. She took a vocal stand against form-altering devices like heavy shoulder pads, urging a soft, natural silhouette instead. Like her hero Vionnet, she cut dresses on the bias, and pieced close-fitting tops out of soft knits. She made women’s clothes from traditional menswear fabrics – cotton shirting and tie silk – and she was an early adopter of “elasticized” leather, source of the cinch belt. Bet you have one of those too. McCardell declared that a woman’s traditional wardrobe made it impossible to pack for easy travel, so she invented a system of separates: split the dress into bodice and skirt, top and bottom, throw in a pair of trousers or two, and all of a sudden you can pack fewer pieces that mix and match together. And, in the bargain, manage your own small suitcase when traveling the world. Townley wouldn’t sell her separates, but McCardell started wearing them herself in the mid-1930s. In 1938, she sewed a revolutionary dress. Based on a traditional Algerian garment, the dress was loose and waist-less, falling in soft wool jersey folds, cut on the bias, from a shoulder that looked much the same front and back. To be worn wrapped with a sash, a wide belt, or the long thin spaghetti ties McCardell popularized – so you could tie your waist where it looked best on you – this “Monastic” dress was bought straight off Claire’s back by a buyer for Best & Co. who saw her wearing it in the Townley showroom. The dress, priced at $30 (inexpensive even then) sold out within 24 hours of its first ad in the Sunday New York Times, as did the second order and the third. It put McCardell on the fashion map, and she designed versions of that dress, short and long, until the end of her career. But it couldn’t get her name on the Townley label. Despite the Monastic’s runaway success, Townley’s owner refused McCardell’s longstanding request that her own designs carry her own name. Townley Frocks closed in late 1938, and McCardell went to work (unsuccessfully) for two other New York houses. In important ways, World War II forced American design culture to catch up with Claire McCardell. For one thing, after June 1940 America’s fashion makers and magazine editors could no longer visit Nazi-occupied Paris to swoon over new Chanel and Schiaparelli. Good design had to happen at home. More fundamentally, war deeply transformed how American women lived. The sudden manpower shortage drove women into the workforce, and there was no one left to help the housewives who stayed home. What’s more, war demand for raw materials led the government to impose strict rationing on the garment industry, limiting which fibers could be used, and how much. Harper’s Bazaar editor Diana Vreeland commissioned McCardell to create an everyday dress that captured this hardworking, competent, multi-tasking ethos. McCardell answered with the “Pop-over,” a self-aproned, wrap-front dress, with an attached oven mitt. At $6.95, she sold hundreds of thousands. Undaunted by government rationing, McCardell continued her pre-war crusade to adapt unconventional materials for women’s clothes, making feminine dresses out of (unrationed) butcher’s apron linen, rayon tablecloth fabric, and surplus weather balloon cottons. When metal shortages made zippers and snaps hard to get, McCardell popularized the wrap-and-tie designs she’d been making since the 1930s, letting sashes or spaghetti ties do the work instead. And shoe rationing? Facing severe leather and rubber shortages, McCardell saw that ballet slippers weren’t included in the government’s restrictions. So she marched over to Capezio, the dance supply company, with a fistful of her fabric swatches. Within weeks Capezio had produced a line of slip-on ballet flats to wear with McCardell’s clothes, launching a new industry in flat women’s shoes. A huge hit then and now, as a quick look in an average closet will prove. So those dresses and the swimsuit in the photographs where I started? McCardell designed them in the mid-1940s. Shockingly modern, for 70 years ago. Not surprisingly, McCardell’s fans included Katharine Hepburn, Rita Hayworth, Rosalind Russell, Babe Paley, and Slim Keith, the iconic modern-chic wife of Hollywood’s Howard Hawks (the wife who “discovered” a McCardell model – the unknown Lauren Bacall – to star opposite Humphrey Bogart in Hawks’ 1944 To Have and Have Not). Life magazine had McCardell design outfits out of fabrics specially created for her by Picasso and Chagall. At the same time, she continued to develop innovative, low-cost fibers, including good-looking, easy-care synthetics like in the yoga pants your friends wear out to lunch. And she always insisted that her clothes stay reasonably priced: her America was a mass-market culture, after all. 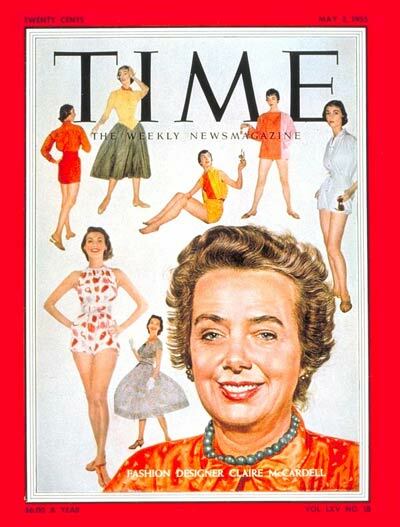 In 1955, she made the cover of Time. In 1958, she died suddenly of colon cancer, at the age of 53. It’s our nature as a culture to tell stories about how we became the “moderns” we think we are now. And Claire McCardell – with her relentless vision of American women as competent, comfortable, and beautiful – belongs in every one. More of the amazing Laura Cooper is available at Norealplot.com. In recent articles in the Washington Post, she’s talked about the valuation of women’s work as mothers and parental anxiety surrounding the college admissions process. Her most recent post at Bacon can be found here. Best Bacon review yet! I love this book, and am glad to see Laura promoting it. Great post. Still not a fan of ballet flats, though. This is a great one, Laura. Vionnet was a predecessor to Donna Karan. You are amazing in your passion. You actually made we want to read about women’s fashion! HA! Good luck tonight for John’s big election! Catching up on my reading this morning. I loved learning about Claire McCardell, Laura. Thank you. I especially loved the “Popover” wrap-around apron that you could “play” in and even “greet you guests” in. I was imagining another icon of that century, Julia Child, and wondering if she ever wore a Popover. Thanks for another good post on Bacon, Jennifer! Fashion is my great interest i have shelves of reference books,–and yet I never knew about Claire McCardell,she is indeed a very worthy designer,is there anywhere a likewise interesting Woman who know what we wear most of the time. America has in the past had so many outstanding designers, everybody should about them, the top i think is Charles James,he was a genious. Thank You. Naomi,Tokyo. Ps, Where do i buy a ‘Popover’ ?